Who would have thought Ginger would be such a powerful oil extracted from the rhizome or root of its plant? It has tremendous benefits for our mental, emotional and spiritual health. Ginger addresses everything about being in “lack” and so it’s very powerful for those who need self-confidence and motivation to put plans and ideas into the physical realm. Ginger allows us to “digest” parts of ourselves that need to be changed so we can better serve ourselves. Ginger promotes the opening of our sacral chakra which governs the small intestine so it’s no wonder that Ginger not only has a positive effect on our digestive system but also on our nervous system in particular with releasing suppressed sexual energy. It also helps process the energy of the solar plexus chakra which is about our self-worth. 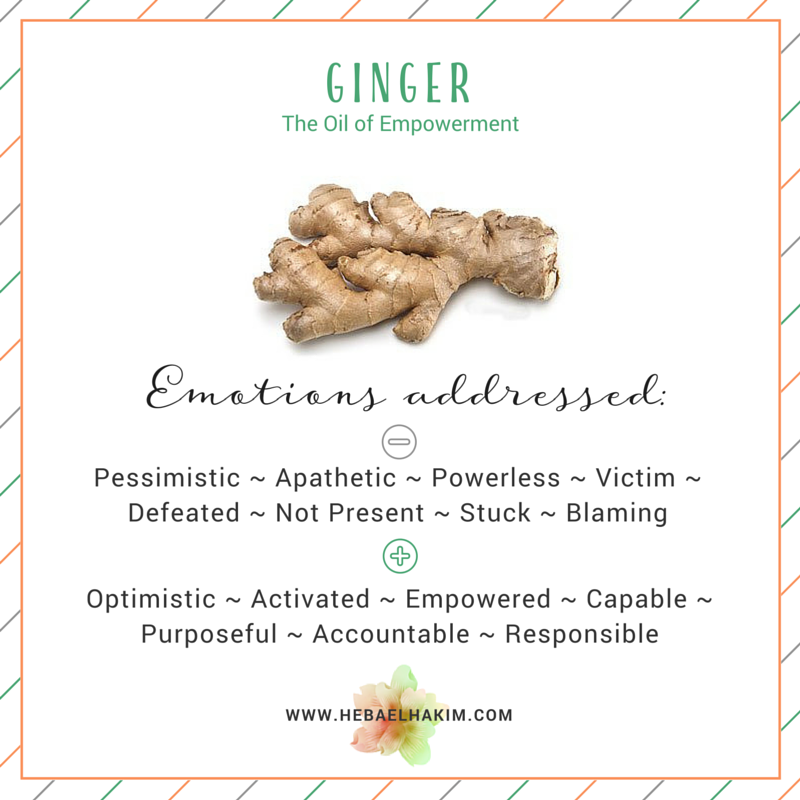 Ginger, being the Oil of Empowerment, addresses feelings of powerlessness, fear and that victim mentality. When we believe everything is outside of our control, we refuse to take responsibility for our life and we blame our circumstances on other people or external factors. That’s victim mentality and it keeps us in a stuck energy, de-centered and dis-empowered. Ginger can be very useful to address patterns of courage or fear, scarcity or abundance and finding a healthy balance between the two sides of the spectrum. Ginger comes in and creates this inner fire of strength that helps us step into a role of Leader in our lives. It empowers individuals to take complete responsibility over their circumstances and infuses a warrior-like mentality that precedes personal integrity, centralised power and personal choice. The individual sees themselves as a creator. Instead of waiting for their outside circumstances to change, the empowered individual takes charge and assumes fill responsibility for their own destiny. They seek Divine guidance and put their Faith and Trust in it, but they take action and are accountable for the consequences of their actions or inactions. Ginger teaches us that to be successful in life we need to have Faith and Trust and be FULLY COMMITTED to the end-result and the process in getting there. Ginger blends well with: Cinnamon (and all spice oils), Eucalyptus, Frankincense, Geranium, Grapefruit and all citrus oils, Rosemary. Depending on your uses for this oil, substitutes may include: Cardamon, Peppermint, Wild Orange.